I just spent a week in Yellowstone with my tour partner Dan. We were scouting for a tour we will be leading this time next year. What an amazing and unique landscape! We look forward to showing the group what we found. I re-learned a couple of lessons on this trip. The first two days were pretty much blue sky days. 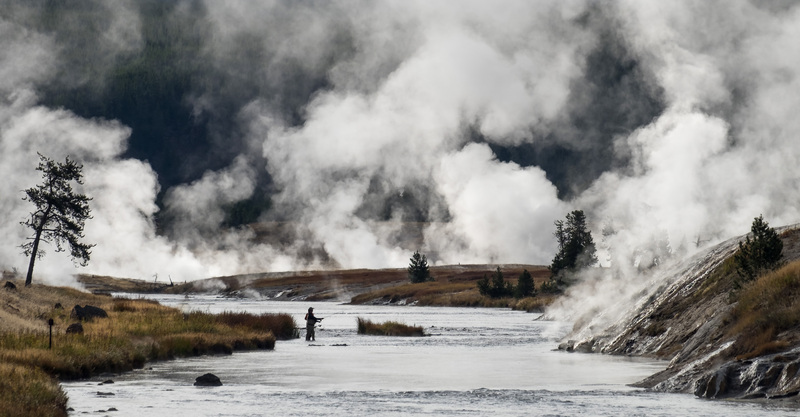 As this was our first time in Yellowstone, I found myself feeling those familiar and uncomfortable feelings of F.U.D. (fears uncertainties and doubts). It looked like a sea of evergreen trees and nothing else. Because it was unfamiliar, I was searching for things and feeling anxious. Heck, our mission was to scout for paying customers. We needed to find things, and find lots of them right now! Dan being the faithful co-leader he is, looked at me and said, “relax John, remember, be open…” I sighed and said, “You mean you want me to actually practice what I teach?” We laughed, but, Dan was right. I needed to slow down and let the images come to me. Once I did that, once I trusted myself and beat away the F.U.D., I was overwhelmed with the possibilities. The second lesson is confirmation that once I relax, I am better at being open to what I now refer to as “the moment of perception.” It is the story behind the blog image, read on. We had scouted the Grand Prismatic Spring the day before without cameras. It is truly magnificent and we wanted to go back to photograph in better light. As I walked over the foot bridge, I looked to my left and “in a moment of perception,” saw this scene. In that moment, I knew there was an image to be made. Rikki Cooke says to our students at the Molokai Workshop, “whenever something turns your head” you must stop and make an image. A moment of perception is something that happens very quickly and without thought. And I believe, it comes from being open rather than having expectations. The key is to act upon it. So, rather than march on toward the other-worldly, colorful spring, I stopped, set up my tripod, and tuned into what the perception was. I silently asked, what turned my head? Now, how best to capture that. Long lens? Wide? Great DOF? Shallow DOF? Color? B&W? 2×3 or panoramic format? All of these decisions, come after the moment of perception. I know I sound like a broken record about expectations, but, there is a reason. They are so hard to get past! I hope these stories help. Please consider the idea of “a moment of perception.” Try to slow down as Dan remained me to do. Try to push aside your F.U.D. and expectations and be open to whatever turns your head. I promise you’ll find wonderful gifts! Totally resonated. Doubly challenging when leading a group because you not only have your own expectations but the group’s as well. Great way to put it in to words. You’re finally there! Yellowstone Lake will never disappoint; just go away from the crowds. Did you take the Beartooth??? YOU MUST DO THIS. DO NOT MISS IT. If you leave the park, head north via Mammoth to Chico Hot Springs. Great hotel/restaurant/hot springs. Not far away, along the Yellowstone River. I’m home now… we need to talk. Great to meet you Amanda. We had a great time. Great post and example – cannot remind (or be reminded) too often to open to perception (often intuition leading to perception). Thanks for a memorable reminder. John, 1st you presented a lovely captivating image. You seem to have used a black and white on top of sepia or muted tones. To me it looks other worldly; a trip to fantasy. It works better than either straight b&w or color. Can I ask, did you have a filter or is this post processing? Actually Peggy, this is pretty much out of camera, very little processing. I considered making is B&W. Hi John – I just read your blog post and couldn’t believe the similarities between it and my post tonight. I think it’s a lesson we all need to learn. It’s ok to go to a place with some expectations – but only if you are also open to other possibilities. Photography should be exploration and reaction to what is there in front of you. Hope you are doing well! That is a truly magnificent image, John ! It’s simply stunning ! The inclusion of that fellow fishing anchors the scale perfectly and adds a touch of reality to what is otherwise an enjoyably fantasmic scene. Many thanks for your “take it to the bank” advice on remaining open to the possibilities around us. How can one ever hope to be in the moment if you’re up to your neck in preconceived notions of how “things should be” ? Thanks much for helping all of us enjoy our photography to the utmost. And please keep the good advice coming ! Good to read your thought process! A lovely moment Bruce. Well done! Thanks for sharing the story too!